Earthquaker Devices is known for creating offbeat or strange pedals. Here is an example of accomplishing that goal with subtlety. 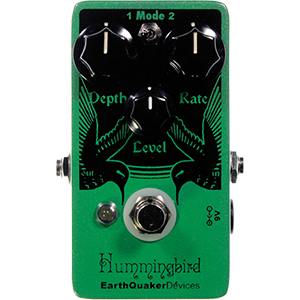 The Hummingbird is a really fun take on tremolo. Using a sawtooth wave at any of three speed modes you can find a lot of fun, simple, or wacky trem sounds. You can also use it as a clean boost pedal when the Depth knob is at zero. This pedal is straightforward and simple. The depth and rate knobs have an intuitive feel and are easy to pin at a spot that sounds good. The mode switcher is somewhat difficult to see in darker situations. Although this pedal really only does tremolo, it can have a surprising amount of colors and textures with the three modes and the surprisingly large sweep of the rate knob (or expression pedal). Wonderful clarity. The depth knob does exactly what it should and will saturate your tone as much as you could hope for. Tremolo is an effect not very well suited for horns, but if you have a use for it, this pedal will work nicely. It gives you more than the standard range of tremolo sounds, and can be a nice source of uncommon textures.